Down eight-to-one in the 34th America's Cup in September 2013, Oracle Team USA pulled off a comeback for the ages, with eight straight wins against Emirates Team New Zealand. Julian Guthrie's The Billionaire and the Mechanic tells the incredible story of how a car mechanic and one of the world's richest men teamed up to win the world's greatest race. With a lengthy new section on the 34th America's Cup, Guthrie also shows how they did it again. The America's Cup, first awarded in 1851, is the oldest trophy in international sports. In 2000, Larry Ellison, co-founder and billionaire CEO of Oracle Corporation, decided to run for the prize and found an unlikely partner in Norbert Bajurin, a car mechanic and Commodore of the blue-collar Golden Gate Yacht Club. After unsuccessful runs for the Cup in 2003 and 2007, they won for the first time in 2010. With unparalleled access to Ellison and his team, Guthrie takes readers inside the building process of these astonishing boats and the lives of the athletes who race them and throws readers into exhilarating races from Australia to Valencia. Julian Guthrie is an award-winning journalist and staff writer at the San Francisco Chronicle. She is the author of The Grace of Everyday Saints: How a Band of Believers Lost Their Church and Found Their Faith. She lives in Mill Valley, California. "Julian Guthrie's riveting book takes readers deep into uncharted realms, from the extremes of the ocean to the sublime connection between two singular men. The Billionaire and The Mechanic is a wondrously detailed story, beautifully told, by a writer who understands both the intricacies of human nature and the immensity of the natural world." 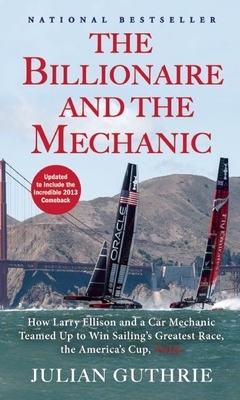 Surely the most comprehensive book ever written about an America's Cup challenge, The Billionaire and The Mechanic will surely be must reading for any yacht-racing aficionado." "[A] product of first-rate reporting. . . . A riveting account." "Energetically written .... sure to spark interest among racing fans." "Larry Ellison's America's Cup victory was as improbable as it was inevitable. The same is true of his alliance with radiator repairman Norbert Bajurin. In this absorbing page-turner, Julian Guthrie tells us how they came together to make history." "If you're interested in the America's Cup competition, or in sailboat racing generally, you'll love this book. Julian Guthrie's taut and fascinating behind-the-scenes account of the colorful personalities, the risky development of astonishing new boats, and the hair-raising racing tactics of Larry Ellison's long campaign to win the trophy is necessary background reading." "A gripping tale of world-class competition and strategic gamesmanship. . . . It will have enduring value as a great story in its own right."